Reamde is Neal Stephenson's first standalone novel in quite sometime. At least it seems to be so far. One never knows with Stephenson. This should especially interest those who loved Snow Crash, but haven't felt a strong enough desire to wade through the somewhat unwieldy The Baroque Cycle. This cover just flat out confuses me, but it also makes curious. Firstly, there is the title Reamde, which when I first read it months ago I could make neither hide nor hare of. Now that I see the cute play with gradation on the cover the cute trick works well: Read Me. A not so subliminal message perchance from Stephenson? Possible, but it also foretells a story involving intrigue quite quickly. The cover overall is certainly subtly impactful staying with such basic colors and fonts. I'm not entirely sure if this cover is the final or merely a placeholder. Either way it is interesting to take a look at. Stephenson is probably a big enough name now to push for this type of cover given his last 4 books have been New York Times best-sellers although it isn't as if he's been lacking in that department much in the past. With Reamde, this visionary author whose mind-stretching fiction has been enthusiastically compared to the work of Thomas Pynchon, Don DeLillo, Kurt Vonnegut, and David Foster Wallace—not to mention William Gibson and Michael Crichton—once again blazes new ground with a high-stakes thriller that will enthrall his loyal audience, science and science fiction, and espionage fiction fans equally. 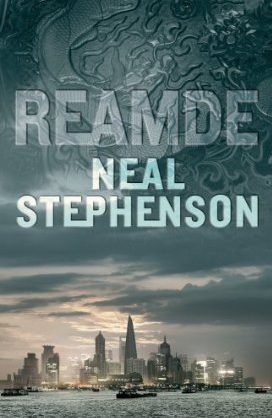 The breathtaking tale of a wealthy tech entrepreneur caught in the very real crossfire of his own online fantasy war game, Reamde is a new high—and a new world—for the remarkable Neal Stephenson. Across the globe, millions of computer screens flicker with the artfully coded world of T'Rain - an addictive internet role-playing game of fantasy and adventure. But backstreet hackers in China have just unleashed a contagious virus called Reamde, and as it rampages through the gaming world spreading from player to player - holding hard drives hostage in the process - the computer of one powerful and dangerous man is infected, causing the carefully mediated violence of the on-line world to spill over into reality. A fast-talking, internet-addicted mafia accountant is brutally silenced by his Russian employers, and Zula - a talented young T'Rain computer programmer - is abducted and bundled on to a private jet. As she is flown across the skies in the company of the terrified boyfriend she broke up with hours before, and a brilliant Hungarian hacker who may be her only hope, she finds herself sucked into a whirl of Chinese Secret Service agents and gun-toting American Survivalists; the Russian criminal underground and an al-Qaeda cell led by a charismatic Welshman; each a strand of a connected world that devastatingly converges in T'Rain. An inimitable and compelling thriller that careers from British Columbia to South-West China via Russia and the fantasy world of T'Rain, Reamde is an irresistible epic from the unique imagination of one of today's most individual writers. Got all that? Because they'll be a test later on. Now we have here the UK cover, which is much more in line with Stephenson's previous novels. Reamde will be released September 20th in the US and the 15th in the UK. Will you be there for it? Don't care for the US cover but I rather like the title. It makes you think. 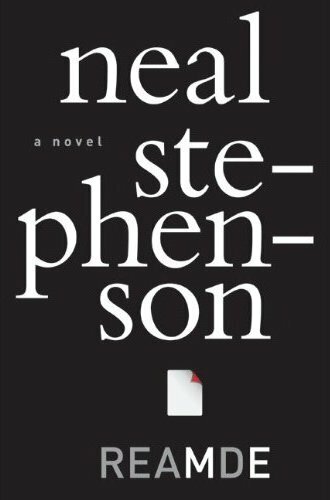 And wasn't Stephenson's last novel (Anathem) stand alone? From what I can tell after a bit of searching Anathem is separate from Stephenson's other books. For some reason I thought it was involved in the same universe as The Baroque Cycle as Cryptonomicon was. new Neal Stephenson? zomg, sign me UP! I've yet to read Anathema, but I am a baroque cycle devotee. Anathem's a stunning book, as long as you're not looking for fast-paced action. For me, the Christopher Brookmyer quote completely sums it up: "The only catch to reading a novel as imposingly magnificent as this is that for the next few months, everything else seems small and obvious by comparison."